Not a single federal law curbing gun violence has passed in the year since a young man from Newtown, Conn., who'd long exhibited signs of mental instability, got a hold of his mother's AR-15-style Bushmaster rifle and two of her handguns and gunned down 20 first-graders and six of their educators at Sandy Hook Elementary School before taking his own life. Capping a year that saw the most mass shootings in U.S. history, Newtown seemed to mark a turning point in national conversation about gun control. Within a month of the shooting, President Obama - promising to make the issue a hallmark of his second-term agenda - had signed several executive orders to make schools safer and gun purchases more transparent. "These tragedies must end," he said, but qualified that real reform would require bipartisan backing from lawmakers on Capitol Hill. Six months after the Dec. 14, 2012 tragedy, Sen. Joe Manchin, D-W.Va., insisted the push for tougher gun laws and bolstered support for mental health in America was "still on the front burner." But foundation for that statement was flimsy. Manchin's own amendment to strengthen background checks for gun purchases - co-sponsored by Sen. Pat Toomey, R-Pa., and seen by many in Congress to be the most realistic hope for immediate reform to gun laws - had collapsed in the Senate two months earlier. Senate Majority Leader Harry Reid, D-Nev., had "hit pause" on debate over firearms altogether, pulling the legislation from the floor indefinitely. 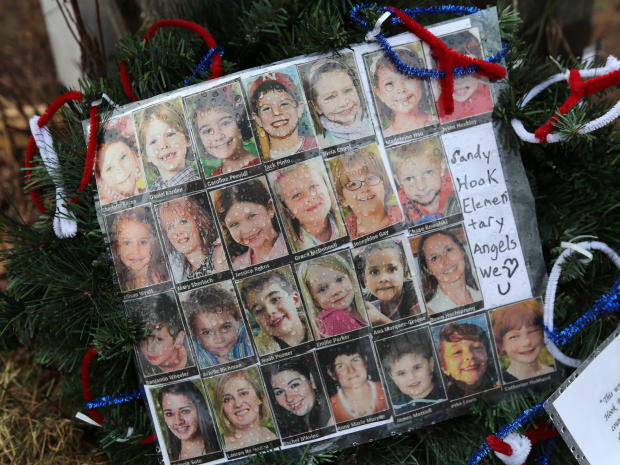 The collective grief surrounding Newtown, it seemed, was no longer driving the conversation about gun control. Like most action rallied in the wake of tragedy, the mindset starting out is, "let's get the legislation, get it now - and then it fades," Bill Sherlach, the husband of Sandy Hook's school psychologist who was killed, told "CBS Evening News" anchor Scott Pelley in April. "Time goes by. New cycles happen. Other headlines come up." "We can't wait for D.C. to pass laws," Nicole Hockley, whose six-year-old son Dylan was killed in the massacre at Sandy Hook Elementary School, said in a separate interview with Pelley last month. She said she learned an important lesson the day the Senate voted down the Manchin-Toomey amendment: "It's not about legislation... it's about us, as a people and as parents, forming these solutions within our own communities and moving forward." Hockley, who's been actively involved with Sandy Hook Promise - a nonprofit formed by Newtown community members to drum up awareness of the causes of gun violence - said most important to her is reining in gun trafficking; Sherlach named limiting magazine capacity. Both those initiatives were part of the ambitious package of proposals the president rolled out in January, but neither saw daylight at the federal level. Advocates for gun control began looking to states as a vehicle for reform. "When Congress failed to pass any new gun violence prevention legislation in 2013, including the overwhelmingly popular legislation to expand background checks, state legislatures answered the call," said a report out this week from the Brady Campaign to Prevent Gun Violence. "Twenty-one states enacted new laws to curb gun violence in their communities, with eight of these states passing major reforms." Sen. Dianne Feinstein, D-Calif., who authored legislation to ban military-style assault weapons, in a statement Friday specifically lauded California, Colorado, Connecticut, Maryland and New York for doing what national lawmakers could not. "I am encouraged that, since Sandy Hook, five states... have imposed or strengthened bans on assault weapons or large-capacity ammunition magazines," she wrote. "Polls consistently show public support for banning the sale and manufacture of assault weapons--the law of the land between 1994 and 2004--and support from a cross section of police chiefs, mayors, clergy, medical professionals and educators." The issue, Brady Campaign President Dan Gross wrote to CBS News in an email, "is Congress, and the disconnect between what the American public wants and supports and what Congress is doing about it. ...I can guarantee you every senator who voted 'no' [on the Manchin-Toomey background check amendment] voted against what the majority of their constituents support." A CBS News poll out this week revealed that support for stricter gun laws has dipped from 57 to 49 percent since the immediate aftermath of the shooting. But 85 percent of Americans back a federal law requiring background checks on all potential gun buyers. Citing that 85 percent, Reid said Friday on the Senate floor Friday that debate about the background check amendment is "not over": "It's going to happen; it's only a question of when it happens," he said. "We won't give up on the victims of 26 school shootings that have occurred since the Newtown mass murder." Earlier this week while meeting with Newtown family members, Vice President Joe Biden offered more concrete action, promising $100 million in federal funding that will go toward increasing the quality of mental health care in the United States. The release of a prosecutor's report last month revealed the shooter, 20-year-old Adam Lanza, as a disturbed man who blacked out his bedroom window with garbage bags and kept spreadsheets of mass murders. Gross said the Brady Campaign is "strongly in favor of improving our mental health systems," but worries the pro-gun lobby "wants us to have that conversation without talking about the very real things we can do to keep guns out of the hands of criminals and the dangerously mentally ill, like extending background checks to online and gun show sales. "...We support a conversation about mental health access," he wrote, "but we will not let it occur at the expense of talking about the sensible, lifesaving gun reforms that 90 percent of the American public supports." Meanwhile, as Dec. 14, 2013 comes and goes, Hockley told the Washington Post, it's "just another day for us... we live with that loss every single day." And she'll continue to fight to make sure that loss wasn't in vain. "For us it's all about making change happen and making something positive come from this," she said. "If it was just a senseless tragedy, I don't know if I could live with that."